Warm grill to medium-hot. Combine olive oil with Montreal seasoning. Rub pork with spice mixture; let stand 10 minutes. Place pork on grill rack. Grill 4 minutes. Turn pork; grill 2 minutes. Brush each chop with remaining seasoning mixture, and grill 2 minutes or until desired degree of doneness. 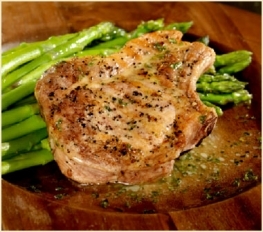 Serve pork chops with applesauce mixed with horseradish. Serves 4.